My name is Mylo. 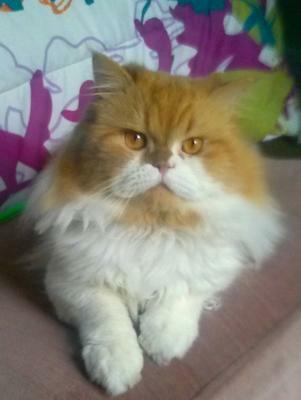 I'm 3, and I'm an orange and white Persian and Himalayan who loves posing for pictures! I enjoy playing and running and I'm very talkative. I also enjoy several naps throughout the day, and I just love hanging out on my kitty tree and my boxes! My mum says I'm a gift from God and I just love her so much! She named me Mylo because I have an "M" on my forehead. I'm so glad she rescued me from a kitty farm because I had the worst fleas ever, and it took months to get rid of them completely. But they are finally gone and I couldn't ask for a better life. I get so much lovings and brushings as I'm very fluffy. Oh, did I mention I'm super fluffy?! Murr! So happy for you. You are a beauty. You are so beautiful. I'm glad you found a wonderful person to care for you. Love his squishy face, he looks similar to my tuxedo-Persian-Siamese mix cats! What a beautiful boy you are! It must be just wonderful to bury one's face in your fluff! I'm so glad you found such a wonderful mom and home. Join in and write your own page! It's easy to do. How? Simply click here to return to Cat Breed Pictures.